A dead tooth (also called a necrotic tooth or non-vital tooth) is one in which the tooth pulp no longer has living tissue and there is no longer a blood supply to the tooth. When this happens, the hollow root canal and pulp chamber inside the tooth become a potential site of bacterial colonization, open to the inside of the body. Frequently, when bacteria find their way into the tooth, and are allowed to multiply unchecked by the body’s immune system, an abscess will result. Often this is accompanied by pain, swelling, and inability to chew on the affected tooth. Sometimes numbness can occur, due to the pressure the infectious fluid places on nearby nerves in the jaw bone. A dead tooth usually has a history of traumatic injury, extensive tooth decay (caries), periodontal disease, or rapid orthodontic tooth movement. 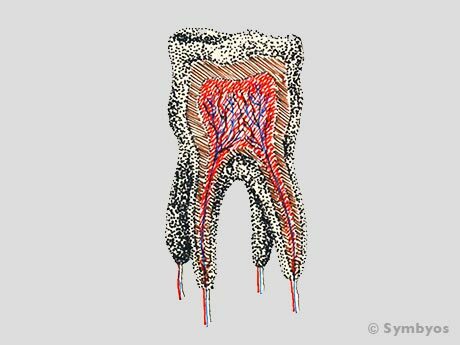 Sometimes, a process called calcific metamorphosis occurs, in which the odontoblast cells that form the dentin layer of the tooth are induced to rapidly deposit large amounts of reparative dentin. 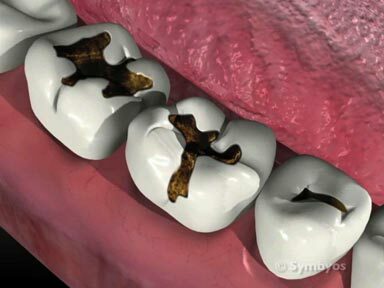 The result is a tooth which appears to have no root canal (although it usually continues to have a microscopic one). These teeth may test non-vital, like a dead tooth. How does the dentist diagnose a Dead Tooth? Figure 1: Intrinsic stain. 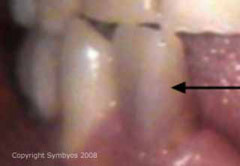 The first clue that a tooth is dead may be its darkened hue (see arrow) from the intrinsic staining of the dentin. A dead tooth that has root canals and pulp chambers is generally diagnosed by its lack of any response to hot, cold or electrical stimuli. Frequently, a dead tooth will appear darker than the other teeth (Figure 1). This finding suggests that the tooth underwent a period in which extensive blood flow to the tooth occurred. Increased blood flow is the body’s response to bacteria moving into a tooth, and the method by which immune cells are delivered. If the tooth has undergone trauma, the body increases blood flow to provide nourishment to the repair cells in the area—the inflammatory response. Increased blood pressure (and volume) forces iron-rich blood pigment (a reddish-brown hue) into the dentin of the tooth, resulting in its darkened appearance. A dead tooth which has accessible root canals will usually undergo root canal treatment (endodontics). It is usually possible to eliminate the dark hue of the tooth after endodontic therapy is completed, by placing a bleaching solution in the pulp chamber of the tooth for a few days. Other treatment may be necessary following root canal therapy, including filling the hole the dentist makes to gain access to the root canals; and possibly a crown or onlay, depending on the type of tooth affected, and the amount of remaining tooth structure. If the dead tooth is heavily decayed, chipped or cracked it may require crown lengthening surgery (a periodontal surgery procedure), a core buildup (a very large filling needed to establish enough tooth structure to place a crown on), and a crown. Sometimes the cost and complexity of procedures necessary to save a dead tooth suggest that the tooth should be removed (simple tooth extractions and surgical tooth extractions), and options to replace it should be considered. If the dead tooth cannot be saved, or the patient does not want to save it, tooth removal is usually an option. A tooth that is diagnosed with calcific metamorphosis generally does not require endodontic treatment, and possibly no treatment at all, unless its crown is noticeably darker than the other teeth and is of concern to the patient. An option in such cases might be to veneer the tooth. The dentist will often take a periapical X-ray to see whether a visible root canal is present. Other imaging techniques may also be suggested.